Razer Giveaway 2015, Color Up 2015 Giveaway, Winner Announced - KABALYERO - PLAY, BLOG & EARN! 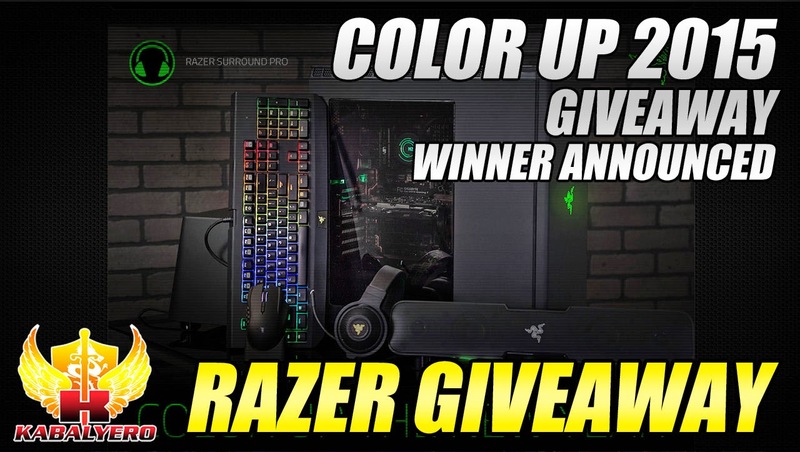 Razer Giveaway 2015, do you guys want to know who won Razer's Color Up 2015 Giveaway? At the end of the year, Razer did a Color Up 2015 Giveaway where one lucky person can win a awesome Razer powered gaming computer. The giveaway ended last January 5, 2015 and the winner was supposed to be announced last January 10, 2015. Unfortunately, the Color Up 2015 Giveaway page never updated and never announced who won the grand prize. I did a little googling and I found out that Razer announced the winner in its Twitter account. Click the link in the description of the video below and it will take you to Razer's Twitter Status Update where the winner of the Color Up 2015 Giveaway was announced or simply click here.